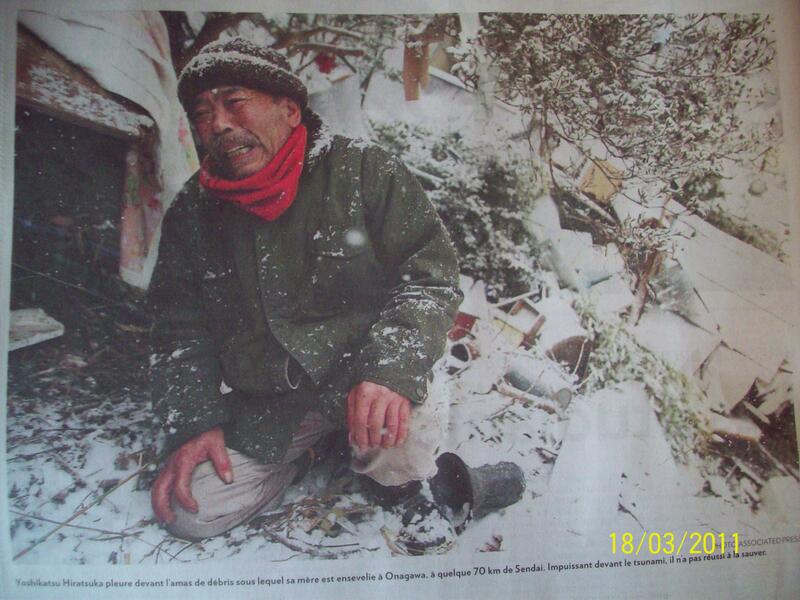 A Japanese man is crying in front of his collapsed house where his mother was killed by the earthquake and tsunami on 11 March 2011 (over 25 000 people were killed and damages estimated to over 230 billions dollars). Today,death becomes a taboo in our modern society.It seems impossible to talk about it in my family.When a member of family dies, his/her family will lives in pains or sorrow and sadness .He/she went into unknown world whereas we are continuing to live in this known world that is full of mysteries and of sufferings too. .But we know very well that one day ,we are going to die also.Life is unpredictable and impermanent.Death does not just makes us cry only when a member of our family died…but could continue to make us cry for the rest of our life each time we think of him again and again. The Death was talked about a thousand times less than the Birth. The Birth makes people happy whereas the Death makes people unhappy. But who knows if to die is to live and to live is to die? (Socrates).Who knows if the Death is another life elsewhere,if not here on earth,in the other world? 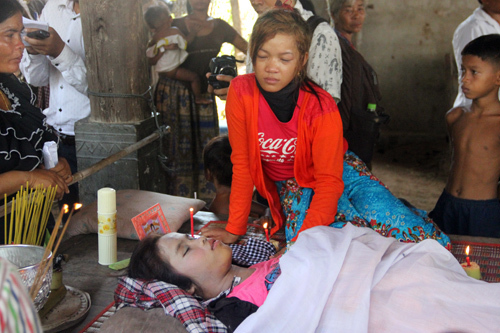 Below is a text that I wrote about the death that hurts me : On 1st January 1986,my uncle Chheang just came back home from the hospital in Khao I Dang and told me that my Brother Chamrong died ,and I was stunned and cry in pains immediately. I hardly believed my ears .Did my uncle tell methe wrong news? The strange news made me to question my ears.But already it hurts me in the deep heart .The news was true.My brother Chamrong died in the night of 31st december 1985 at age 6. My uncle was with me for a moment,telling me that worst news and then he went outside the house and let me cry bitterly. From that time on,I could not hope to live a pleasant life . Therefore,no more pleasure,no more good time for me. I will live to endure this pain.In deep grief ,I felt as if my heart tore.In consciousness,I imagined my brother`s faceas if he was in front of me who embrace him .And in reason,I thought that I was not alone to get such a suffering. I sometimes consoled myself by seeking to hear and share the bitter sufferings of other people.I supposed then that they suffered at least as much as I did,if they thought that they suffered their most terrible pains.But I did not tend to measure or weigh their pains. It seems to me that people who suffered worst pains do need to be consoled,not necessarily by someone or friends ,but by seeking how to be self-consoled.By this way ,we usually happen to ask ourselves some big questions concerning life and death. We maybe wanted to know what happen after death and we seek to get answers.Then we could believe thatdeath is not real ,since the dead did not ” die”. One day,perhaps by the end of January 1986,when I was sitting in a chair outside the house for leisure,I heard a distant sermon talked in a loudspeaker from pagoda.It was after noon. So,it seemed a little quiet that I could hear the sermon clearly. And I listened to it with interest because it was about the death.From this sermon,I heard that the death is just like a change of the house : when the house was destroyed, the owner will search for a new house.What the sermon talked about other things,I could not remember.I felt then much relieved from my pains. Therefore,I felt like listening to what people talking about the death.Of course,I believe that the death is not the end. After the death,the dead will be born again one day ,in new body.However,this little belief did not satisfy me very much, because I wanted to know more about the Death! Perhaps, everybody has already thought about death sometimes seriously.And certainly He/She knows that one day the death will come and take him/her out of this world .If he did not think much about the death ,that’s because he is very far from the death, or his worldly ife keeps him from thinking about the death or because he lives a very pleasant life and there is no one of his family`s members died.For many the death is really an unpleasant subject of discussion,above all,when they are young. But curiousity arouses in all people,and this could be various, according to the degrees oftheir interest.However,the problem of death is concerned with everyone.Everyone opposes the death to live. The death is the worst thing of life.That`s why everyone seeks to avoid the death to live as long as possible.But the death has its schedule for everybody.Nobody knows when the death comes to him except the death itself.The reason why most people seem to avoid to talk about the death is that the death makes them feel sad,or distressed.They don’t have any pleasure to talk about it. By contrast,they like to talk about life ,since life is the best thing .They know about life much more than the death.Do they hate to hear from the death?Or do they fear the death?Those who do not fear the death, fear nothing!And What happens after the death?Is there something after death? Those who seek to know about (understand)the death,I believe, will not find unpleasant the talk of the death.This would probably be the most important question that men face with.If there is something like a sort of divine judgment after the death, everyone should consider the death as a passage door between the present and the futur,And He should then learn to live well and die well also since there is something awaiting him in the hereafter. I read the book “Apology of Socrates” a longtime ago and I was interested in the dialogues between Socrates and his disciples on the day of Socrates`s death.Socrates talked much about the death with them by asking questions.Furtherrmore,He tried to demonstrate the immortality of the soul,which once was combined with the body is called “life”.The demonstration ,I believe,is more satisfying than I expected.Socrates told a myth of after-death at the end of the dialogues,having a reasonable belief that there would be something after the death since the soul is immortal. And this “something” is worth for the good men than the bad men. Socrates exhorted us to live well (to take care of our soul) if we wish to get something good in the hereafter,since we exist in a real Being.That`s the soul who stays in the”totality of time”. By this expression,I mean that we are immortal because in reality,we are not our body,we are our soul,a thinking being or a thinking substance. To introduce you to what the death seems to look like,I bring here a true story of a man who had a near-death experience. He is French.His name is Gérard Charouqui.Mr Charouqui was wounded in a car accident in 1990,and He was almost dying.Theaccident was terrible but banal.What we got more from him is his witness of the near-death experience: “At one moment ,I found myself…over my inert body.I saw it lying inert.I tried to move it.butnothing was answered.Then I asked myself what I`ve done there! A strange process started to work: I began being drawn into a sort of whirlpool,little like a Russian mountain in alien festival.It was dreadful.There has been strident cries and whistles, a harsh music.I did not happen to get out of there,horrible!Suddenly came the calm and I felt seeing a Black Hole,the entry of a tunnel,and being drawn pitilessly inside this tunnel…I`ve gone forwards,I`ve floated blind in the tunnel.Little by little,I perceived a small white light at the end of the tunnel.And Itwas getting bigger until it became very lively and strong. Meanwhile,I`ve been dazzled by this light and attracted like a butterfly towards a pane.Snatched! At the end of the way,there was a landscape of this new world which was cottony,calm and serene.I`ve been encercled by a halo of light,intergreting this cosmos.Again I felt myself turning at a giddy speed.But this time,It was no more unpleasant. I saw my life going on like on the movie`s screen.I had two sons , one of them was 6 years old.I lingered on the familiar scenes… I`ve been very attracted by this total calm,the serenity and the wish of going to look further far away.And then I thought of my body : I decided to come back.”Mr. Charouqui was hospitalized in the hospital of Lisieux and underwent several operations.In the room of reanimation,when he opened his eyes,he said “I am awake” and he cried ,suffering from pains.my body was torn in pieces,Unbearable!His wife was there,near his bed.Two or three days later ,after he was able to talk,he told her all about what he experienced.After some reflexions,he believed that his experience was real. some doubt could not keep him silent.However something has changed in him : Nevermore I wanted to have such physical pains!.But today, I’m not afraid of the death anymore!For me, that`s a life elsewhere!.The near-death experience of Mr. Charouqui could not generalize the aspects of the death.It just gives us an example of the near-death experience(a partial death)So there would be a distinction between the near-death and the death.And there will be more things to discover in the death. If the death is a life elsewhere,why people fear it badly? For this question ,we have to know that all people desire to live as long as possible until old age.But people can live forever?who desire to live forever?can a man be young forever to live his life happily without having to die? There was a time when it was possible to forestall this natural kind of death indefinitely if only some powerful incantation or magic potion were available.The alchimist of Middle Ages,for example incessantly sought an “elixir of life” that would keep a man forever young.In the Middle Ages too,many people firmly believed in the existence of a miraculous “fountain of youth”,which had been described in a letter supposedly written by Prester John,a fabulous Christian Monarch of Asia.The sixteen century Spanish explorer Juan Ponce da Leon not only believes in the legend but set out for the New World in order to discover the fountain of youth. Men no longer seek the elixir of life or the fountain of youth today, they accept the idea that ,as Shakespear put it:” death , a necessary end,will come when it will come ” But it`s true that men want to live a long life by understanding that death is not bad in itself because nobody is immortal,nobody is young forever.As it`s not bad,it would be reasonable with the fact that we get older and older with the passing of time we are living.And now what is oldness?Old people are less active than young people, like the plants when they are young,grow actively(quickly) and seem always more elegant than when they become old.Byt the oldness, all life degenrates and approaches the death.Those who do not accept death,wouldnot accept to become old either because becoming old means approaching death. Talking about death here,I don`t think of anything else but the real(natural) death thatwas caused by oldness.The other causes of death are the problems of life.And so,men must face with these causes and keep themselves in life as long as possible.For these various causes,I mean men or animals or plants exist only under certain conditions .Man ,for example,must constantly draw oxygen from the air or from some other source,he must drink water so that his bodily tissues may be bathed in fluid,he must have food to supply him energy and with body-building materials; the temperature to which he is subjected must be neither too high nor too low.If these cinditions and various other are not fulfilled,death will result. a man may die as result of mischance.He may succumb to a wound receive on the field of battle;he may be the victim of a murderer; he may accidentally take poison,he may starve to death or die of thirst. The lower animals are no less liable to fatal mishap.The deer may be wounded by a hunter;the moth may fall into the flame;the fly may be trapped in the web of a spider;the worm may be crushed by a human foot. These kind of death are fearful and are so to be avoided by all men or animals.But some kinds of chance play in these games of life and death.The stronger live longer than the weaker. The richer live a more pleasant life and longer life and sometimes vice versa..It`s a chance! So all “life” lives according to its destiny ,among all kinds of dangers on earth.And whatwe know more is that life could not avoid pains,sickness,oldness and death.